This is The Tape With Sticktivity! Made with superior adhesives, Mavalus tape sticks where most temporary tapes fail. It’s great for walls and other surfaces, including brick and damp cinder block. It’s removable in most cases with no sticky residue. 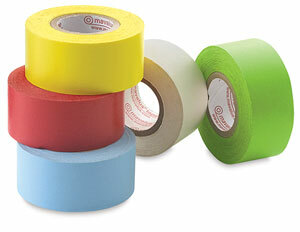 Mavalus Tape is available in five colors and two widths, in 324" long rolls. It’s also available in a handy measuring tape format. ® Mavalus is a registered trademark.® Mavalus is a registered trademark. ™ The Tape With Sticktivity! is a trademark.